Today I am saying "Goodbye" to my old sofa and love seat. Now don't laugh...We have owned this sofa and love seat since 1991. The back story is: Our daughter had just married and we were remodeling our entire home. 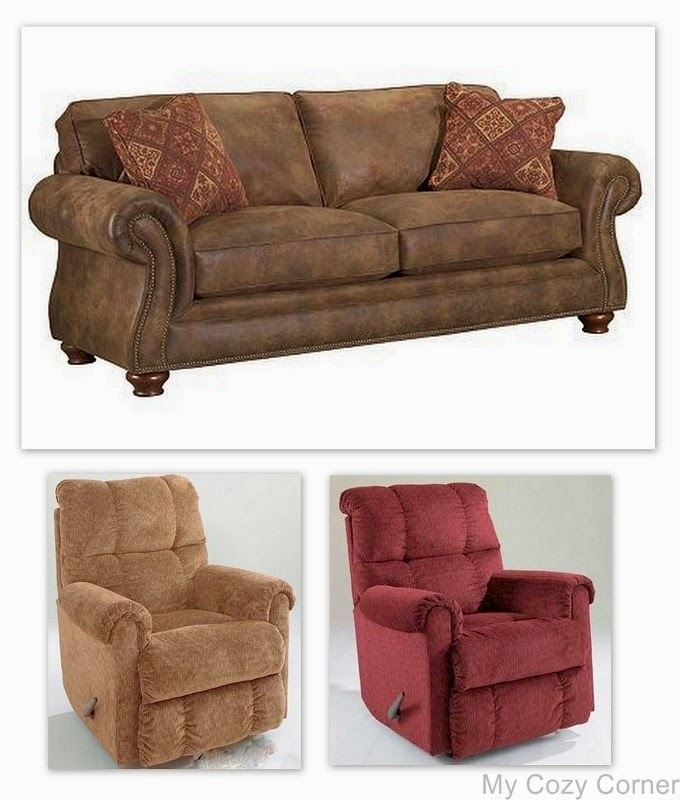 The sofa, love seat and two recliner rockers were all purchased at the same time. Now twenty some years later it's time to buy new carpeting for our living room. And we wanted to buy two new matching recliners for our old bones and bad backs. After all the old recliners were over 20 years old. Who keeps furniture that long? We do!!! This post is written to document the way our home has looked for over twenty years and also to show you our new sofa and chairs. I took this photo below with my 18-55 lens. I would love some suggestions about a different lens to use for this type of photo. The love seat has a new pillow I made to celebrate the upcoming Thanksgiving holiday. I found the Gather Together tea towel at Aaron Brothers for $8.00. I bought a small pillow at Jo Ann's craft store and sewed an envelope slip cover in about 10 minutes. I love it. We are not replacing the love seat, and the tables will be placed in front of our new sofa. I have a beautiful sofa table behind the love seat that I'm excited to see decorated for Christmas. I made this mosaic with our new sofa and chairs. We had the new recliners delivered the same day we purchased them, but the sofa will be delivered in two weeks. I put the sofa and love seat on Craigslist and ONE HOUR LATER I had it sold. Now we have a large empty living room for a week or so. Thanks for visiting and hope you have a great week. Don't you love buying new furniture? I'll bet you'll really enjoy your new sofa and chairs. They look really comfy. Oh the joys of a recliner! We have 2 in the living room and 2 in the family room where the TV is and the grands know they are for grandma and grandpa. The new furniture looks comfy. Betty I love that new sofa....old fashioned and cozy!